That’s just vile, of course. And of course just yesterday we heard about the Virginia public school teacher who forced her class to figure out attack strategies against the GOP presidential candidates and then make a plan to contact the Obama campaign to reveal their attack strategies. 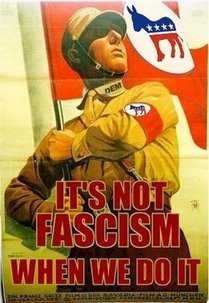 You just can’t make this (fascist) stuff up. But, as is always with the left, it just keeps getting worse with these vile thugs. Usually when the media talks about high school kids at the Wisconsin Capitol it’s been about teachers bringing students to protest Wis. Gov. Scott Walker and his budget cuts. But we have some different news to bring you today: during a visit to the Capitol last Thursday, some Wisconsin high school students decided to fight back against the anti-Walker sentiment they were witnessing during an impromptu visit. Pro-union protesters performing a sing-a-long in the Wis. state Capitol. In short, students from Sheboygan Lutheran High School decided to stop by the rotunda in Madison while in town for the state high school basketball playoffs. While there, they witnessed protesters signing about unions and solidarity. So they decided to drown them out with pro-walker chants. Students from Sheboygan Lutheran drown out pro-union protesters. On Thursday March 15, 2012 the afternoon Solidarity Sing Along was taken over by a large group of supporters from Lutheran High School in Sheboygan. The students, parents and supporters were all in town to participate in the WIAA Boy’s High School Basketball Tournament and arrived at the Capitol for a celebratory rally and to have their photo taken with their legislators. A small group of singers was located on the ground floor of the rotunda for their weekly Thursday afternoon song circle which was quickly drowned out by the thunderous cheers of the LHS group. Shouts of “LHS” and “Stand with Walker” thundered through the rotunda and was met with wide approval from the LHS supporters. One student entered the circle to mock and taunt the singers with dance moves. The extremely loud and boisterous encounter could be heard in the Assembly chambers, where legislative business was still being conducted. The Solidarity Sing Along remained calm and peaceful throughout the ordeal and eventually moved outside to continue singing while the rotunda erupted in approval. Later on, several visitors from the LHS group were given a standing ovation by some legislators in the Assembly when they were introduced by their legislators. Excuse me, did the students take over the State Capitol and refuse to leave, set up camp, damage walls, threaten legislators, crash through police lines, encourage police insurrection, sit down in hallways blocking access, pound on buses carrying legislators, lock their heads to railing, or do any of the other destructive things the anti-Walker protesters did for weeks on end last year? (added) Oh, and did I forget the death threats? It‘s worth mentioning that from the video we’re not sure if the students broke out into chanting at the prompting of others or if it was organic. But I will say that I’ve been to the Wisconsin state high school basketball playoffs in Madison, and kids chanting is as common as snow in January. When about 300 Sheboygan Lutheran High School students and supporters piled into the rotunda of the State Capitol in Madison last Thursday after the boys basketball team clinched a trip to the finals for the Division 5 WIAA state championship, they had some time to spare. Sharing the rotunda with a small group of pro-union demonstrators singing songs, the Lutheran High group broke into spontaneous cheers “Stand with Walker!” interspersed with cries of “LHS! LHS!” and the Common Doxology. The resulting furor since the event has surprised school officials and state Sen. Joe Leibham, a Lutheran High alumnus who invited the group to the Capitol for a photo with the team and a celebratory reception. In reality, said Lutheran senior Emily Mech, who was in the group that day, the students were there only to greet the team. The students are apparently bemused by the whole thing – the school has a variety of political viewpoints represented, and one student even expressed the opinion that the issue might possibly have been blown out of proportion. Some say the original incident was just an episode of school spirit that coincidentally went political. Whatever the reason, let’s hope union members and activists have bigger fish to fry in Wisconsin than high school students. Only in a world where the Democrat Party exists can you have thugs calling high schools with threats.